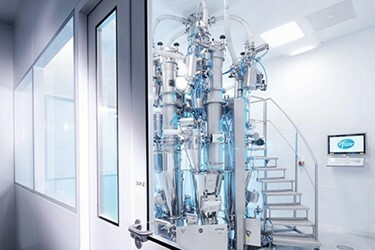 Coperion K-Tron has supplied two feeding systems to Pfizer Manufacturing Deutschland GmbH in Freiburg, Germany, as part of a project to expand their existing plant and switch to continuous production. The Coperion K-Tron feeding systems are a key part of the new continuous production concept. At Pfizer, the compact arrangement of pharmaceutical feeders supplied by Coperion K-Tron accurately deliver ingredients into the continuous mixing process, thereby guaranteeing consistent and very high quality end products.